The questions below are ones that we frequently receive from people interested in Alaska's volcanoes. Since some of these questions are answered by information in this website (and other websites), we've provided links for you to follow to learn of the answer(s). How many active volcanoes are there in Alaska? Alaska contains over 130 volcanoes and volcanic fields which have been active within the last two million years.These volcanoes are catalogued on our website: http://www.avo.alaska.edu/volcanoes/. Alaska's volcanoes are potentially hazardous to passenger and freight aircraft as jet engines sometimes fail after ingesting volcanic ash. 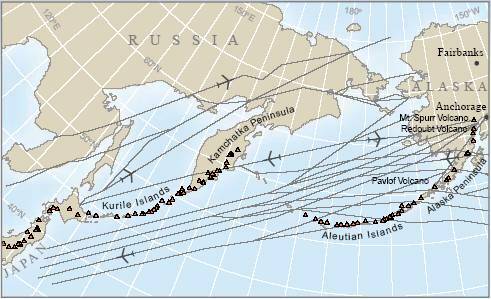 On December 15, 1989, a Boeing 747 flying 240 kilometers (150 miles) northeast of Anchorage encountered an ash cloud erupted from Redoubt Volcano and lost power in all four jet engines. The plane, with 231 passengers aboard, lost more than 3,000 meters (~9,800 feet) of elevation before the flight crew was able to restart the engines (Casadevall, 1994). After landing, it was determined the airplane had suffered about $80 million in damage (Brantley, 1990). We estimate, based on information provided by the Federal Aviation Administration, that more than 80,000 large aircraft per year, and 30,000 people per day, are in the skies over and potentially downwind of Aleutian volcanoes, mostly on the heavily traveled great-circle routes between Europe, North America, and Asia. Volcanic eruptions from Cook Inlet volcanoes (Spurr, Redoubt, Iliamna, and Augustine) can have severe impacts, as these volcanoes are nearest to Anchorage, Alaska's largest population center. The three eruptions of Mt. Spurr's Crater Peak in 1992 deposited ash on Anchorage and surrounding communities, closed airports, made ground transportation difficult, and disrupted air traffic as far east as Cleveland, Ohio. More information about this eruption is available here. Many older Alaskans also remember ash falling on Anchorage during the 1953 eruption of Mt. Spurr's Crater Peak. The 1912 eruption of Novarupta and Katmai, which formed the Valley of Ten Thousand Smokes on the Alaska Peninsula, was the largest 20th-century eruption on earth, and the largest historical eruption in Alaska. Ash from Novarupta spread worldwide, and is often still remobilized by strong winds. Roofs in Kodiak collapsed due to the weight of the ash; six villages close to Katmai and Novarupta were permanently abandoned. More information about this eruption is available here. Information on older volcanoes previously listed by AVO, and Alaskan mountains that have erroneous eruption reports can be found here. Where can I find a list of latitudes and longitudes for volcanoes in Alaska? A list of all volcanoes in Alaska, presumed active within the last 2 million years, and their latitudes and longitudes, is available at http://www.avo.alaska.edu/volcanoes/latlong.php. How can I volunteer at / intern at / study at / work for AVO? Please read the introduction to AVO for information on the structure of AVO, as well as our participating agencies. Volunteering: AVO has no formal volunteer program. Internships: AVO has no formal internship program. Graduate study: AVO does support some graduate studies at the University of Alaska Fairbanks. Employment: Employment opportunities at AVO may occur at all three of our parent agencies. When available, jobs will be posted on the appropriate agency's web site (University of Alaska Fairbanks, the USGS, or the Alaska Division of Geological and Geophysical Surveys). Why are there volcanoes in Alaska? How do Alaskan volcanoes form? As the plate descends into the mantle (dense rock that underlies the earth's crust), it undergoes a series of chemical and physical changes caused by increasing pressure and temperature. First, the water that is stored in subducted sediments and in the oceanic crust is released. Then, at greater depths, water-bearing minerals (such as hornblende) change into non-water-bearing minerals (such as pyroxene). Water given off by this process, along with dissolved impurities, rises into the overlying mantle. The addition of water to the mantle lowers its melting point and is one of the primary processes that leads to the production of magma. Magma also forms as the mantle, stirred by the motion of the descending Pacific Plate, rises to a position beneath the volcanoes (see Formation of Subduction Zone Volcanoes). mantle-derived magma, it pools and begins to change in character. First it heats, then melts, and then mixes with the surrounding crust or country rock. As the magma cools, it begins to crystallize and the crystals that form differ in composition from the magma. This is important because the crystals separate from the liquid, which changes the magma's composition still further; it becomes richer in those chemical components not concentrated in the crystals. This process is called fractional crystallization, or fractionation. The most fundamental change that results from the fractional crystallization of magma is the increase in silica. Throughout the fractionation process magma changes from the initial basalt to andesite and then to dacite. As the silica content of the magma increases, the magma continually becomes less and less dense until it reaches a point where it is lighter than the crust that surrounds it and then resumes its rise to the surface. Depending on the magma's rate of ascent, it can continue to crystallize, fractionate, and assimilate with the surrounding crust producing, in extreme cases, rhyolite with up to 76 percent silica. When the magmas finally reach the surface, if they are relatively poor in dissolved gases, they erupt non-explosively and form lava flows or domes. If they are rich in dissolved gases, they explode violently (like a shaken soda bottle) and form columns of volcanic ash that can reach more than 15 kilometers (45,000 feet) into the atmosphere. The processes outlined above are a thumbnail sketch of the complicated processes that form the volcanoes of the Aleutian Arc. Current models suggest that the Wrangell volcanoes formed in a very similar way and are associated with a small sliver of the Pacific Plate that is thrust northeastward beneath central Alaska. Several of the Wrangell volcanoes are among the most voluminous andesite volcanoes in the world - several times the volume of Mt. Rainier. There are two major types of volcanoes in Alaska not directly tied to the Aleutian subduction zone. The first type is a series of small craters (and one larger one, Mt. Edgecumbe, near Sitka) scattered throughout southeastern Alaska. These small volcanoes may result from the intense shearing along many strike-slip transform faults that are caused by the northward movement of the Pacific Plate. Deep crustal fractures such as these faults may allow magma to rise and volcanoes to form in areas where magma could not normally reach the surface. If nobody lives up there, what hazards are there from eruptions at Alaskan volcanoes? Alaska airspace is extremely busy with long-range, wide-body aircraft as well as bush planes and smaller aircraft. The Anchorage International Airport handles more international air freight (in dollar value) than any other airport in the United States; the Fairbanks International airport, located in Alaska's interior, is ninth on the list and handles more and more freight each year. More than 60,000 aircraft and 10,000 people fly over or very near Alaska volcanoes as they travel the north Pacific (NOPAC) and Russian far east (RFE) air routes. The reason for all the activity is Alaska's unique geographic location. All direct air routes between the United States (even Los Angeles and New York) and Asian cities such as Tokyo and Hong Kong pass along the NOPAC routes. Also, most of the aircraft carrying freight between Europe and Asia come through Anchorage for refueling. A considerable percent of all air freight on earth passes near Alaska's many volcanoes. hundred potentially active volcanoes (red triangles). Encounters between aircraft and volcanic ash are serious because the ash can cause severe damage to the engines as well as other parts of the airplane. Two processes damage jet engines, particularly long-range, wide-body airplanes such as DC-10s and Boeing 747s that are used for international transport. The first damaging process is the mechanical abrasion of the moving parts in a jet engine, such as the compressor and turbine blades. This abrasion reduces the efficiency of the engine but does not typically cause engine failure. Another process with potentially more dangerous consequences is the introduction of ash into the hot parts of an aircraft's engines. Jet engines, particularly those on large airplanes used on international routes, operate near the melting temperature of volcanic ash. Ingestion of ash can clog fuel nozzles, combuster, and turbine parts causing surging, flame out, immediate loss of engine thrust, and engine failure. How do you monitor volcanoes? As magma moves beneath a volcano prior to an eruption, it often generates earthquakes, causes the surface of the volcano to swell, and causes the amount of gases emitted by the volcano to increase. By monitoring these changes, scientists are often able to anticipate eruptive activity and issue warnings of possible hazards. While not all of these changes are observed before every eruption, combining observations of each of these precursors often allows scientists to forecast eruptions. Often the first indication of an impending eruption is an increase in earthquake activity. Generally, a network of six to eight seismometers are positioned around a volcano. Readings from each seismometer are continuously radioed to a central recording site where scientists determine the locations, sizes, numbers, and types of earthquakes. In the weeks or days prior to an eruption the number, size, and type of earthquakes that occur beneath the volcano will often increase. In many cases, the earthquakes will move to progressively shallower depths beneath the volcanic vent. At some volcanoes, low-frequency earthquakes and a continuous seismic disturbance called tremor will occur shortly before an eruption. As magma moves to shallower depths it can cause the surface of the volcano to swell. Scientists monitor the deformation of the ground surface using a variety of surveying techniques and instruments. Electronic distance meters (EDM) bounce infrared light off of targets on the volcano's surface to accurately determine the distance between the EDM and the target. Repeated measurements allow the displacement of the target to be measured. Scientists may also use the global positioning system (GPS, a network of precise navigational satellites) to monitor changes in the ground's surface. In some cases, instruments called tiltmeters are cemented to a volcano's sides. These instruments operate much like a carpenter's level and record the amount the volcano's surface bulges or tilts. Data from both tiltmeters and GPS receivers can be transmitted from the volcano to a central recording site for real-time analysis. As magma nears the ground's surface, it releases several types of gas. These include water (steam), carbon dioxide, and sulfur dioxide. Sulfur dioxide is the easiest of these to monitor. Measurements of sulfur dioxide concentrations are made using an instrument called a correlation spectrometer (COSPEC) which can measure the absorption of sunlight by sulfur dioxide. The COSPEC can be used from the ground or mounted in an airplane or helicopter that then circles the volcano. AVO also observes volcanoes in Alaska an on the Kamchatka Peninsula in Russia using the Advanced Very High Resolution Radiometer (AVHRR) on the NOAA-12 and NOAA-14 satellites. The images are received at a ground station at the Geophysical Institute, University of Alaska Fairbanks, and are analyzed daily to detect volcanic eruption clouds and thermal anomalies at volcanoes in the north Pacific region. This important tool allows AVO scientists to keep an eye on the many volcanoes not yet monitored by the current seismic network. The Okmok eruption of 1997 is a prime example of the importance of this rapidly expanding technology. Geologic studies of the deposits of past eruptions are an important component in identifying hazards at a given volcano. Frequently a given volcano will develop a characteristic eruptive style and size that will remain approximately the same for thousands of years. Identifying the types and sizes of past eruptions allows estimates of the areas and types of hazards that may be expected in the event of a future eruption at a given volcano. Decades of monitoring many restless volcanoes around the world have shown that each volcano is different. Some reawakening volcanoes, such as Mount Spurr, show increased earthquake activity for many months before they erupt, while others, like Redoubt Volcano, many have less than a day of increased seismic activity. Some volcanoes will deform visibly, as at Mount St. Helens, and some will not. Other volcanoes, like Augustine, vent large quantities of gas before they erupt. How often do volcanoes in Alaska erupt? Most reports of eruptive activity date from 1760 on although a few vague reports of eruptions exist between 1700 and 1760 (Grewingk, 1850). At least 265 historical eruptions have occurred at 29 Alaskan volcanoes and another 45 are possible since 1760 giving a frequency rate of 1.1 - 1.3 eruptions per year. Since many eruptions early in this period surely went unreported, this is a minimum figure. The problem of estimating eruption frequency through an analysis of the historical record is well-illustrated in Fig. 5 where the number of eruptions per decade in the Aleutian Arc is plotted for the past 200 years. Reported eruptions show a general increase beginning in the 1870-1880 decade and continuing to the 1920-30 decade where the rate of increase levels off. This increase is assumed to represent expanded travel to this remote area and advances in rapid communication (i.e., newspapers and more recently radio) of eruptive events; interestingly enough, the decades including World Wars I and II show significant decreases. The sharp increase in the 1980-1990 decade has been followed by a return (estimated in part - see caption of Fig. 5) to pre-1980 levels. A more meaningful eruption frequency estimate can perhaps be calculated over the 50 year period 1945 (the end of World War II) through 1994, a time that marked the beginning of widespread air travel and other commerce in this remote part of the world. During this 50 year interval, 90 eruptions have been reported from 23 volcanoes for a frequency of about 2 (1.8) eruptions per year. Although these are estimates of the number of separate eruptions per year, many individual eruptive episodes are spread over weeks and even months. In any one year, therefore, it is not unusual for 3 or 4 Alaskan volcanoes to have experienced eruptive activity. Can I use the images from the AVO website? Most images on AVO's website are free for use by other people and publications. Please check the specific constraints displayed with the image you are interested in. If the image is available for use, please cite the photographer, as well as any agency the photographer was associated with. This information is provided with each image on AVO's site. If in doubt, please email the AVO webmaster. Where do I find high-resolution images of Alaska's volcanoes? You can obtain the highest-resolution copy available of any image on AVO's website by clicking on the thumbnail of the image, and then clicking the "Full Size" link in the individual image window. Please see above for information on image use restrictions. Do you have any images of Alaska volcanoes erupting? Yes. You can search our images for images of erupting volcanoes. Try searching for images linked to the keywords "Eruption cloud/ plume/ column" and "Fire fountaining." To find images for a specific volcanic eruption, search for that eruption, then click on the "Images" tab for that eruption. Does AVO work on other volcanoes? Scientists from AVO often do work on other volcanoes, particularly in times of a volcanic crisis elsewhere in the United States (for example, some AVO scientists traveled to Oregon to assist with monitoring Mt. St. Helens in late 2004.) AVO scientists also routinely monitor volcanoes in Kamchatka, Russia (via satellite images). Why do you work with Russian volcanologists? Russia's Kamchatka Peninsula is home to 29 active volcanoes, including 7 snow-capped stratocones more than 10,000 ft (3,000 m) high. Several eruptions each year in Kamchatka produce ash clouds that threaten the safety of air travel across the North Pacific, including travel between the United States and Russia and Japan. The Kamchatkan Volcanic Eruption Response Team (KVERT), created in 1993 through a cooperative effort of Russian and U.S. scientists, monitors the volcanoes of Kamchatka to provide warnings and rapid reporting of eruptions.For more information about KVERT, please see this PDF report (.5MB). Where can I find more information about a specific eruption? Can you send me a sample of volcanic ash or rock? AVO does not distribute rocks or ash samples to the public. AVO collects rocks and ash samples for scientific analysis in support of its mission to better understand volcanic behavior in order to save lives, avoid damage to aircraft and other property, and to provide timely warnings of explosive activity. Samples are collected for use by AVO and its scientific collaborators only. Still can't find your question? Do you have a question you'd like to see listed here? Please contact us.